There are two things more important than anything to the Golden State Warriors’ playoff chances this season: the fragile left and right ankles of Andrew Bogut and Stephen Curry. That much is a given, and it’s something we’ve known since GS acquired the Australian seven-footer at last year’s trade deadline in the controversial deal that sent fan favorite Monta Ellis packing. 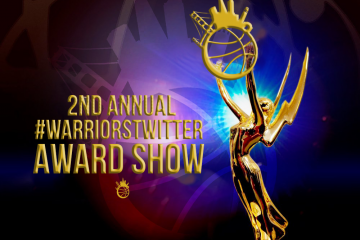 The Warriors – solid off-season not withstanding – simply don’t have the talent to keep their collective head afloat in a loaded lower-half of the Western Conference if their two best players miss significant chunks of the season. 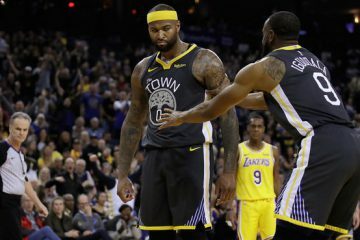 They’re hardly alone in that respect, of course, but that harsh possibility is more likely to take place for Golden State than perhaps any other team in the league. The front office knew the risks in mortgaging the team’s future in a three-man core (along with David Lee, of course) that’s been so prone to injury, and made the Bogut-Ellis swap anyway. It’s the type of aggressive, all-in move that organizations like this one need to take in getting out of the Western Conference cellar for good. The Curry-Ellis-Lee model’s ceiling was decidedly lower than this group’s anyway, backcourt redundancy and poor defense limiting their potential to a pesky, first-round thorn in the side of one of the conference true elite come Spring time. This current Warriors squad offers present and future potential much greater than that. 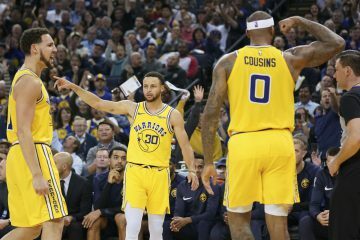 Strong ankles and better depth won’t be enough for Golden State to take that ever-steeper step to major relevancy, though; development of young players is key for this team as much as any other with big postseason dreams like Utah and Minnesota. And that’s where sophomore shooting guard Klay Thompson – who was was named “most likely player to have a breakout season” in a survey of NBA GMs, by the way – gives Golden State the upper-hand. For understanding Thompson’s rapid ascent during his rookie campaign goes a long way in determining just how good Golden State can be and the type of player he can ultimately become. After all, if getting Bogut in blue and gold was the chief justification in the Ellis deal, freeing time and shots on the wing for Thompson was a crucial ancillary one. That Thompson would be held in such high regard by league front office heads at this point in his career seemed the slimmest of possibilities mid-way through last season. The eleventh pick in the 2011 flashed his renowned world-class jumper, sure, but hardly the type of floor-game that would scream potential star. He averaged eight points per game on 44.4% from the field and 46.4% from three-point in 38 games off the bench behind Ellis, scoring mostly in catch-and-shoot situations or off-ball cuts to the basket. Seeking a player comparison, Thompson seemed closer to Anthony Morrow than a vintage Ray Allen. Then in early March he enjoyed what up to that point was the best stretch of his season (scoring in double-figures four consecutive games), Ellis was subsequently traded, and the trajectory of his career – and maybe this franchise – changed forever. In 28 games and starts after the Ellis trade, Thompson averaged 18.6 points per game on 44.2% from the field and 38.8% from deep. That’s a significant uptick in scoring, obviously, but still doesn’t tell the story of his near-complete makeover as an offensive player. To do that you need to dig into advanced stats, and to best illustrate the differences between pre-Ellis and post-Ellis Klay we call on graphs. Before we get into the real nitty-gritty of Thompson’s offensive development, it’s crucial to understand the discrepancy in aggression between his play before and after the Ellis trade. To do that we’ll use points per 36 minutes (pretty self-explanatory) and usage rate, a measure of how many of a team’s possessions end with a player shooting, assisting, or turning the ball over. 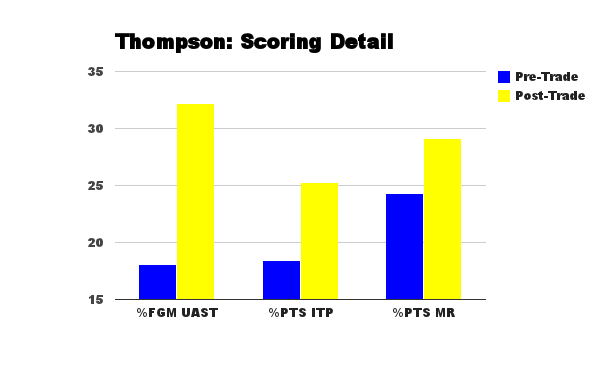 The graph immediately jumps off the page in both respects; Thompson scored more often and took on a much bigger offensive role when he was entrenched as Golden State’s starting shooting guard. This is hardly revelatory stuff, obviously, but it backs up what the naked eye told us after Ellis’ departure – that Thompson has much more floor-game than a typical deadeye, catch-and-shoot marksman like Kyle Korver or Steve Novak, a question that lingered through the season’s first half. The above is a basic breakdown of how Thompson got his points before and after the trade. And like the previous graph, it goes to show the varied offensive game he displayed once he was given more freedom and opportunity. 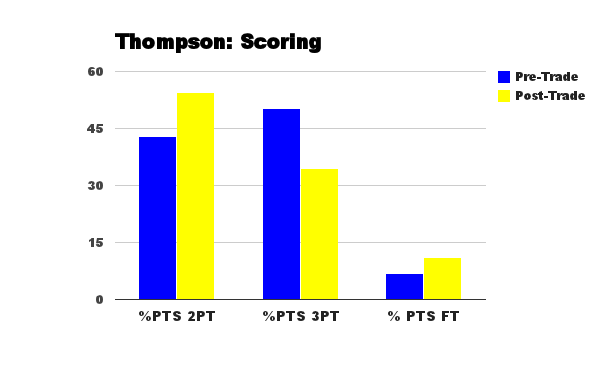 Thompson subsisted mostly on three-pointers the first 38 games of the season, scoring 50.3% of his points via the long ball. For reference, that mark places him near the season-long number of guys like Jodie Meeks, Jimmer Fredette, and Allen. So Thompson’s first-half play confirmed the pre-draft evaluation that his game needed some diversity on offense. Fortunately and perhaps surprisingly to most, he displayed just that in the season’s second stanza, getting 34.6% of his points off three-pointers and 54.4% via baskets inside the arc, a jump of 11.6% from before March 13. Similarly, his percentage of points off free throws rose 4.2% to 11.1%; hardly a prolific number, but a marked improvement nonetheless. As tellingly positive as the previous chart was regarding Thompson’s offensive diversity, this one is even more so. Of particular interest are the two left-most groupings, his percentage of baskets unassisted and percentage of points scored in the paint. There isn’t a better indicator of isolation scoring frequency than the former statistic, evidenced by the league’s leaders here consisting almost solely of point guards. Thompson’s pre-Ellis mark of unassisted buckets was 18.1%, placing him four full points below Allen’s season-long number and near the very bottom of all guards. In the final 28 games of 2012, though, 32.2% of his makes came without an assist. While nowhere near the league’s leaders and still in the bottom-half among guards, that number almost equals those of Avery Bradley and DeMar DeRozan and is better than Jason Richardson‘s. Novak or Daequan Cook those guys aren’t, and it’s reasonable to suggest Thompson will only get better here as his game continues to grow. Just as erstwhile troubling and presently encouraging as Thompson’s baskets unassisted growth is similar progress in points in the paint. 25.3% of his points came from that area of the floor in 2012’s final 28 games, up 6.9% from the season’s initial 38 contests. The former number ranks just below Deron Williams’ and more than three points better than JR Sm‘s. Again, even Thompson’s improvement keeps him in the league’s lower-half among guards, but the takeaway is the same; he got markedly better with Ellis in Milwaukee and seems primed to continue that progression as his career goes along. 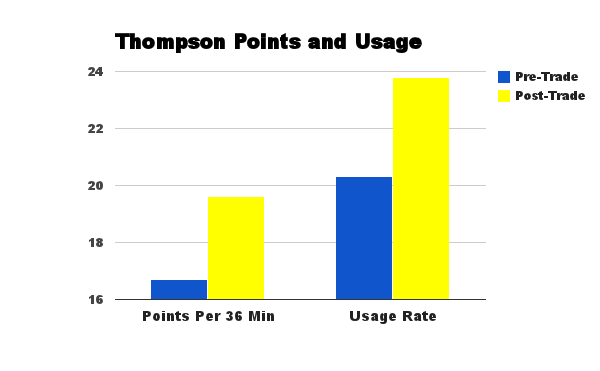 The other category charts Thompson’s percentage of points scored from mid-range. He saw a smaller bump here in the second half of the season – 29.1% from 24.3% – compared to unassisted scores and paint points, but an important one nonetheless. As he becomes more of a focal point of the Golden State offense this is a skill that will come in handy; teams will no doubt try to run him off the three-point line as much as possible, giving him ample opportunity for pull-up jumpers from inside the arc. So the fortunes of this season and future ones depend mostly on the health of Curry and Bogut. We all know that, and it’s a fate this organization’s been married to since last March. 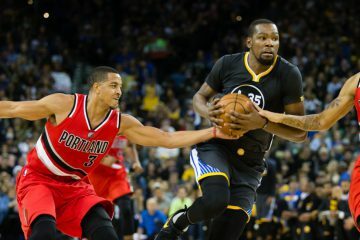 The Warriors won’t threaten in the West unless their two best players are at their best, and if they are Thompson’s play will be more important than any other’s on the roster. The rare prototype shooting guard in today’s era that has size, athleticism, shot-making ability, and a developing off-the-dribble game, he offers more hope and promise than almost any player in the league. Our eyes, the league’s general managers, and these graphs show us as much. Thompson alone is reason for major optimism for a beleaguered franchise like this one, let alone when his game is complemented so well by those of Curry, Bogut, and Lee. This is a new era for the Warriors and it’s an exciting one, wrought with almost equal potential for success and disappointment. Here’s hoping it’s the former, not only because this franchise and fan base is starving for it, but because a player with Thompson’s bright, bright future deserves it.